America is a country of car and truck lovers, but buying a car is a lot different than searching for one online. We looked at Google search data to see which states were searching for particular makes and models more than any other state. In doing that, we took the search volume for all cars and trucks, then compared that to the national search volume. Ranging from SUVs to hybrid cars, here’s a look at what we found. According to Google, since last year there has been a 7 percent search growth for motor vehicles. To breakdown that search, 62 percent came from mobile and 32 percent came from desktop searches. Despite General Motors recently stating that they expect industry vehicle sales to fall short of their projected model, auto sales have been very strong. In fact, 97% of new car buyers researched their purchase online prior to arriving at the dealership according to automotive research company Carkeys.co.uk. The car that the most states search for goes to the Buick Enclave. This car is the most searched vehicle in Iowa, Kentucky, Minnesota, Nebraska, North Dakota, South Dakota, Ohio and Wisconsin. Different models of Subarus are also popular online. Subarus are most searched for in Idaho, Massachusetts, Oregon, Pennsylvania, Utah and West Virginia. Only two states search the most for the Electric/Hybrid category, Washington and California. With sales of Chevrolet EV Bolt in California rising 91% in the first quarter of 2017 and nearly 15% of the cars in the state required to be zero-emission vehicles, it’s no surprise that the Tesla is popular in California. On the East Coast, the most popular category is Hatchback/Crossover category. Specifically, the Volvo XC70. This is the most Googled car in Maine, Vermont, Connecticut, New Hampshire and Rhode Island. Bigger states search for bigger cars. In Alaska and Montana, it’s all about the massive Ford F350. Texas loves the Chevy Silverado. In the southeast, Texas, Louisiana and Arkansas Google trucks the most out of any vehicle. An Automotive News Data Center study revealed that three pickup manufacturers Ford, GM, and Ram Trucks sell an average of 6,500 trucks each day, so clearly Americans enjoy their trucks. SUV Google searches are spread out among Illinois, New York and Alabama. Small/midsize car searches are most popular in Idaho, Florida, Indiana, Georgia, Kansas, Missouri and a few other states. Neighboring states have similar taste in categories. North Carolina, Virginia and West Virginia are interested in the small/midsize category. 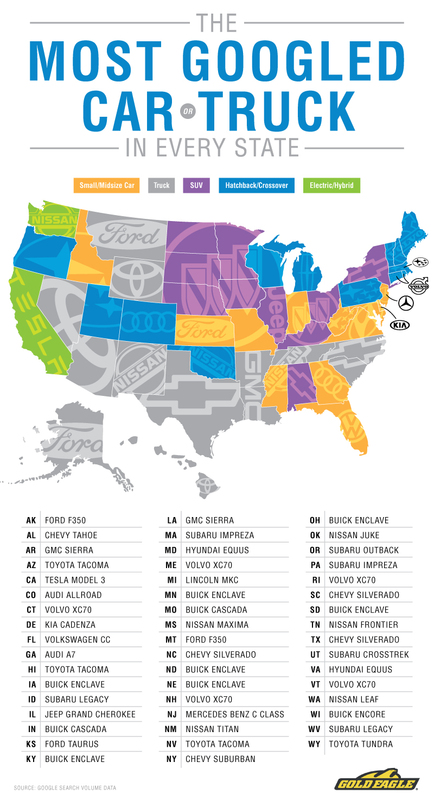 Likewise, North Dakota, South Dakota and Minnesota search for the Hatchback/Crossover category the most. Texas, Louisiana and Arkansas went for the Truck category. While Google doesn’t share exactly what the intent behind each vehicle search implies, the data showing how people are researching and learning about these vehicles is an interesting look into online consumer behavior. For information on car maintenance, products and tips, click here.